While imported Chinese porcelain had become a valuable commodity in Europe in the seventeenth century, local attempts to produce porcelain long remained unsuccessful. At last the secret of hard-paste porcelain was uncovered, and in 1710 the first European porcelain was manufactured in Saxony. Meissen porcelain, still manufactured today, soon ranked in value with silver and gold. 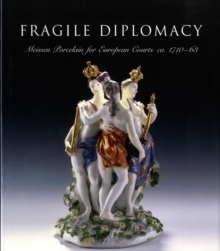 This thorough and lavishly illustrated volume explores the early years of Meissen porcelain and how the princes of Saxony came to use highly prized porcelain pieces as diplomatic gifts for presentation to foreign courts. An eminent team of international contributors examines the trade of Meissen with other nations, from England to Russia. They also investigate the cultural ambience of the Dresden Court, varying tastes of the markets, the wide range of porcelain objects, and their designers and makers. Individual chapters are devoted to gifts to Denmark, other German courts, the Holy Roman Empire, Italy, France, and other nations. For every Meissen collector or enthusiast, this book will be not only a treasured handbook but also a source of visual delight. Pages: 400 pages, 400 color illus.